THE FAMILY OF murdered IRA and Sinn Féin member Denis Donaldson have said that there is no reason for a delay in the inquest into his death, claiming that the treatment of the family by the gardaí is “entirely consistent with recent public scandals”. Donaldson was shot at his home near Glenties in county Donegal eight years ago next month and, in a statement released through their solicitors, his family claim that gardaí are “stringing along the Coroner’s court”. The treatment of the Donaldson family is sadly entirely consistent with recent public scandals affecting the gardaí. Indeed, some of those involved in these scandals have had direct involvement in Denis’s case. Donaldson ran for Sinn Féin in the 1983 UK General Election and worked for Sinn Féin in the Northern Ireland Assembly in Stormont before being outed as an MI5 agent in 2005. 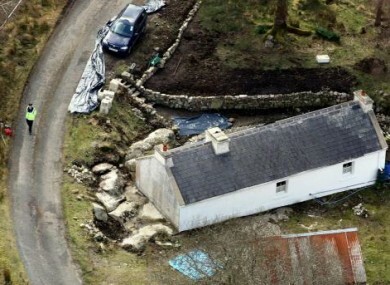 Donaldson then went into hiding before his location was tracked down by the media to an isolated home in Donegal, where he was shot and killed a number of weeks later. The Real IRA claimed responsibility for his killing but an inquest into his death has been repeatedly delayed to allow time for further garda investigations. The family say that there have now been 13 preliminary inquests without a full hearing. “Next week will mark the 8th anniversary of Denis’ killing,” the family say in its statement. “From the outset the Donaldson family have implored gardaí to rigorously investigate the role played by state agencies in the circumstances surrounding the exposure and killing of Denis. Throughout that time, gardaí have refused to probe these concerns and admitted to the family that they closed the file on Denis’s death without interviewing those members of special branch who were actively involved in events leading up to Denis’ killing. There have been inquest hearings every six months into Donaldson’s death but the family say they will not be attending today’s hearing. Family members have instead instructed their representatives to take legal action as they feel that the gardaí have acted with a “flagrant disregard European Court of Human Rights obligations”. The inquest went ahead in the family’s absence in Letterkenny today with The Belfast Telegraph reporting that gardaí say that they have uncovered “new and significant” leads in their hunt for Donaldson’s killers. Superintendent Michael Finan told the inquest that the DPP has been told that that “additional evidence may be forthcoming”. Email “Family of murdered spy Denis Donaldson accuse gardaí of delaying death inquest”. Feedback on “Family of murdered spy Denis Donaldson accuse gardaí of delaying death inquest”.